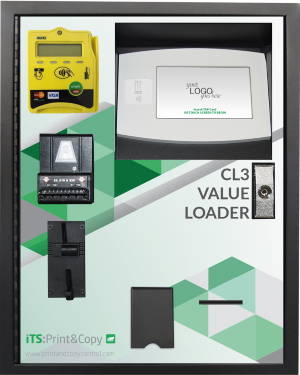 The ITS CL3 is a fully featured value loader which can be configured to accept a combination of coins, notes or cards for topping up user accounts. The user simply presents their card or enters their ID Number, inserts required funds and optionally, prints a receipt. It is ideal for environments where staff time is at a premium and self-service is essential due to the minimal operator assistance required. Accepts multiple user card formats such as ABA, magnetic stripe, prox and barcoded. The ITS:Pay-As-You-Go (PAYG) Elite Cash Acceptor is a high performance yet economical solution that combines print release, account loader and copy controller into a single unit which facilitates controlling and charging for printing and copying. The 7.5” colour LCD touch screen can be equipped with a magnetic swipe, contactless or barcode card reader for user authentication. Once authenticated, the user is able to deposit money into their PaperCut account and the print or copy transaction is processed, charged for and logged. The print job is then released, or the copy function enabled, and the transaction balance is displayed. 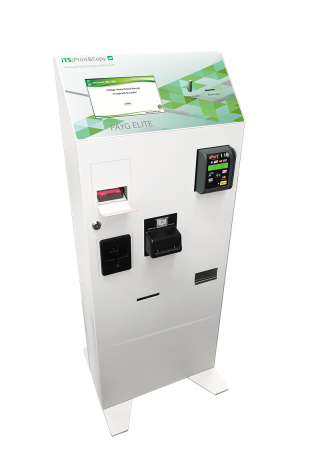 The ITS:PAYG Elite Cash Acceptor is the ideal solution for environments such as public libraries, university campuses and internet cafes. The ITS K3 PaperCut Payment Kiosk is a stylish and durable touch screen device designed especially to run PaperCut Pay Station software. Available in coin and note payment formats it provides users with an easy way to add credit to their print and copy accounts.Users are able to log on to add credit via their username and password, swipe card, barcode or proximity card including both Mifare and HID all from the convenience of a robust, fully integrated device.